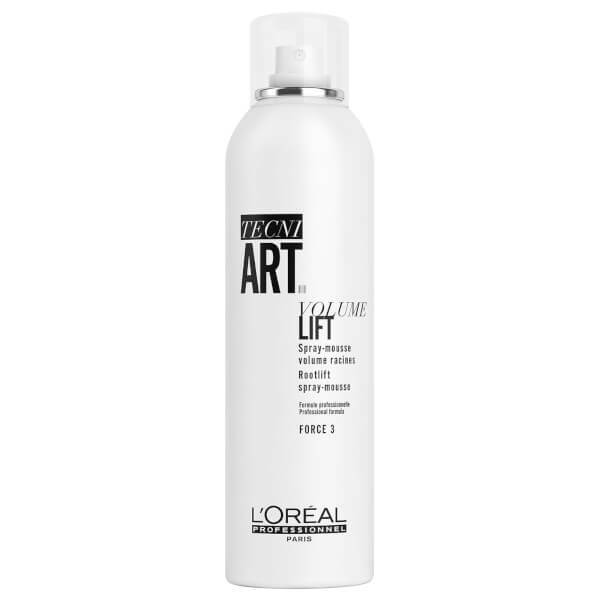 Turn up the volume with the L'Oréal Professionnel Tecni.ART Volume Lift, a lightweight but effective root lift mousse that gives maximum support for achieving big volume with minimal fuss. Lifting flat roots to build and sculpt body and bounce, the mousse delivers a volumised effect where your locks need it most, whether you’re after a subtle lift or a high-fashion big ‘do. Leaves ends feeling light and supple while adding height at the roots. Onto damp or dry hair, apply directly on the root area. Aqua / Water, Dimethyl Ether, Alcohol Denat., Isobutane, Polyquaternium-11, Butyl Ester Of Pvm/Ma Copolymer, Triethanolamine, Amodimethicone, Polyquaternium-4, Polysorbate 20, Hydroxypropyl Guar, Cetrimonium Chloride, Trideceth-15, Trideceth-3, Linalool, Benzyl Salicylate, Benzyl Benzoate, Benzyl Alcohol, Phenoxyethanol, Citronellol, Limonene, Acetic Acid, Parfum / Fragrance. C193389/1.